​Thurtene began as a secret society in 1904. 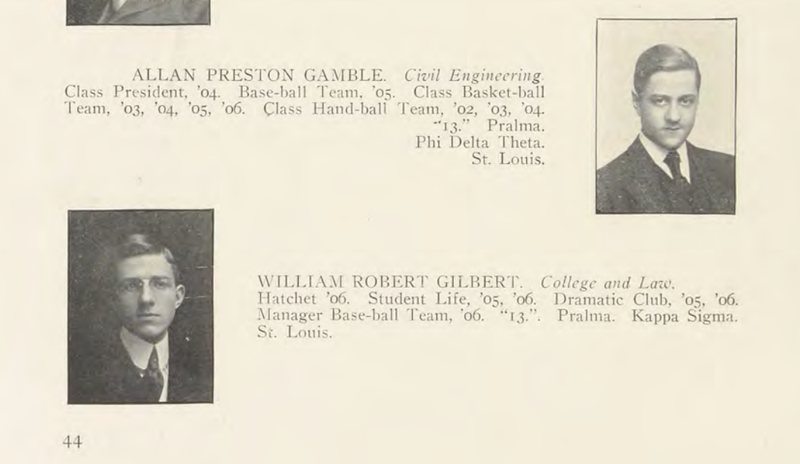 Members were chosen in their junior year and revealed after their graduation in Washington University’s yearbook “The Hatchet,” with the number “13” listed next to members names. This piece is intended to provide students with a record of already existing resources on Thurtene’s history of controversial practices with respect to finances and transparency. "Thurtene was formed in 1904 as a secret society of men chosen for their leadership, character, and participation in campus activities. Membership varied in the early years from 4 to 14, then finally settled into a consistent 13. Thurtene found its purpose in 1935 when it was asked to rescue the floundering student circus from the senior honorary Pralma, which had merged with another group. Thurtene rose to the occasion and steadily improved the carnival and itself, while weathering the storms of World War II, the turbulent 1960s, the entrance of women, and the threat of carnival cancellation. ​"Only in 1943 was there no Thurtene Carnival, when the war so decimated the organization's ranks that the remaining members voted to replace themselves with a complete set of 13 new members the same year." This article also discusses one-time ties between Student Union, the Chancellor, and Thurtene, when a referendum passed to increase student activity fees to pay for reallocation fees in order to move the location of the Carnival in 1983 from the Athletic Complex parking lot (which was under construction) to its current location by Brookings. "Thurtene does not want the success of the Carnival to be based solely on monetary terms… The purpose of the Carnival is to bring together Washington University student organizations and open our campus to the surrounding communities. The fact that the net proceeds from the Carnival are donated to a local charity strengthens this objective but is not the primary purpose of the Carnival." However, Westoff explains that the corporate sponsors and student groups which bankroll the carnival advertise it as a charity event in advertisements -- and that Thurtene themselves identifies the carnival as a charity event in press releases and posters. Westoff notes the 100,000+ attendance of the carnival should produce significantly more profit than what has been donated in the past. Thurtene does not overlook individual student group bookkeeping. Groups can donate full or partial sums to the chosen charity; donate to a different charity; or not donate at all. When the Panhellenic and Interfraternity Council proposed setting a minimum donation requirement for individual booths in 2002-2003, Thurtene rejected it. WUTV's documentary on Thurtene's Carnival originally aired in 2005 but received little attention until it was published online in 2007. The documentary expands Westhoff's research, providing more insight into student perspectives on Thurtene. Student groups pay Thurtene to use the lot during the Carnival. Thurtene receives the lot for free. The society also receives a percentage of profit from outside carnival vendors. Thurtene claims all proceeds go to their designated charity, however, “proceeds” is a loosely defined term: it does not include money generated at individual booths. Groups who operate booths are not required to donate the full sum or any sum at all of their revenue from the carnival to the selected charity. Student groups and sponsors have in the past chosen to donate to a different charity, or keep the profit for themselves. The documentary also highlights ties between Thurtene and the university. There is a “Thurtene book” containing financial and historical information on the society stored in the West Campus Library archives which is only accessible to current and former members of the society. (WU People's History contacted the WashU's Special Archives and the book is still held in the library archives and is still only available for viewing by current and former members.) Thurtene also has a history of direct ties to WashU’s Office of Public Affairs through their former beloved advisor Jim Burmeister. The secrecy surrounding Thurtene’s profits and donations has led to speculation of misspending and misinformation on the carnival’s previous success.